Hypoglycemia (also spelled hypoglycaemia or hypoglycæmia, not to be confused with hyperglycemia) is a medical emergency that involves an abnormally diminished content of glucose in the blood. The term literally means "low blood sugar" (Gr. ὑπογλυκαιμία, from hypo-, glykys, haima). It can produce a variety of symptoms and effects but the principal problems arise from an inadequate supply of glucose to the brain, resulting in impairment of function (neuroglycopenia). Effects can range from mild dysphoria to more serious issues such as seizures, unconsciousness, and (rarely) permanent brain damage or death. Hypoglycemia is treated by restoring the blood glucose level to normal by the ingestion or administration of dextrose or carbohydrate foods. It is often self-diagnosed and self-medicated orally by the ingestion of balanced meals. In more severe circumstances, it is treated by injection or infusion of glucagon. Recurrent hypoglycemia may be prevented by reversing or removing the underlying cause, by increasing the frequency of meals, with medications like diazoxide, octreotide, or glucocorticoids, or by surgical removal of much of the pancreas. Hypoglycemia (common usage) is also a term in popular culture and alternative medicine for a common condition characterized by shakiness and altered mood and thinking, but without measured low glucose or risk of severe harm. It is treated by changing eating patterns, i.e. eating regular balanced meals with reasonable portions and avoiding excessive sugar. In those treated for diabetes a diagnosis of hypoglycemia can be made based on the presence of a low blood sugar alone. Otherwise Whipple's triad is required which include symptoms consistent with hypoglycemia, a low blood sugar, and resolution of these symptoms once the blood sugar improves. Research in healthy adults shows that mental efficiency declines slightly but measurably as blood glucose falls below 65 mg/dL (3.6 mM) in many people. Hormonal defense mechanisms (adrenaline and glucagon) are normally activated as it drops below a threshold level (about 55 mg/dL (3.0 mM) for most people), producing the typical hypoglycemic symptoms of shakiness and dysphoria. :1589 Obvious impairment may not occur until the glucose falls below 40 mg/dL (2.2 mM), and many healthy people may occasionally have glucose levels below 65 in the morning without apparent effects. Since the brain effects of hypoglycemia, termed neuroglycopenia, determine whether a given low glucose is a "problem" for that person, most doctors use the term hypoglycemia only when a moderately low glucose level is accompanied by symptoms or brain effects. Diabetic hypoglycemia represents a special case with respect to the relationship of measured glucose and hypoglycemic symptoms for several reasons. First, although home glucose meter readings are often misleading, the probability that a low reading, whether accompanied by symptoms or not, represents real hypoglycemia is much higher in a person who takes insulin than in someone who does not. Second, because injected insulin cannot be "turned off," diabetic hypoglycemia has a greater chance of progressing to serious impairment if not treated, compared to most other forms of hypoglycemia. Third, because glucose levels are often above normal for long periods of time (hours, days, or months) in persons with diabetes, hypoglycemic symptoms may sometimes occur at higher thresholds than in people whose blood sugar is usually normal. For all of these reasons, higher meter glucose thresholds are often considered "hypoglycemic" in people with diabetes. 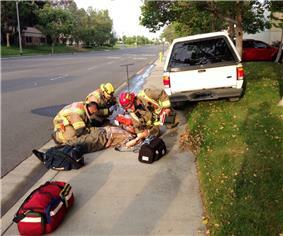 Paramedics in Southern California attend a diabetic man who lost effective control of his vehicle due to low blood sugar (hypoglycemia) and drove it over the curb. It may take longer to recover from severe hypoglycemia with unconsciousness or seizure even after restoration of normal blood glucose. When a person has not been unconscious, failure of carbohydrate to reverse the symptoms in 10–15 minutes increases the likelihood that hypoglycemia was not the cause of the symptoms. When severe hypoglycemia has persisted in a hospitalized patient, the amount of glucose required to maintain satisfactory blood glucose levels becomes an important clue to the underlying etiology. Glucose requirements above 10 mg/kg/minute in infants, or 6 mg/kg/minute in children and adults are strong evidence for hyperinsulinism. In this context this is referred to as the glucose infusion rate (GIR). Finally, the blood glucose response to glucagon given when the glucose is low can also help distinguish among various types of hypoglycemia. A rise of blood glucose by more than 30 mg/dl (1.70 mmol/l) suggests insulin excess as the probable cause of the hypoglycemia. The importance of an adequate supply of glucose to the brain is apparent from the number of nervous, hormonal and metabolic responses to a falling glucose level. Most of these are defensive or adaptive, tending to raise the blood sugar via glycogenolysis and gluconeogenesis or provide alternative fuels. If the blood sugar level falls too low the liver converts a storage of glycogen into glucose and releases it into the bloodstream, to prevent the person going into a diabetic coma, for a short period of time. When suspected hypoglycemia recurs and a critical specimen has not been obtained, the diagnostic evaluation may take several paths. However good nutrition and prompt intake is essential. Prescription misfill can also be a cause of severe unexplained hypoglycemia; for example, sulfonylureas accidentally given to non-diabetics can dangerously lower blood sugar. Symptoms will coincide with a recent prescription refill. A 1 mg estrogen tablet closely resembles the 4 mg glimeperide pill, making the two easy to confuse for the pharmacist and the patient. Blood glucose can be raised to normal within minutes by taking (or receiving) 10-20 grams of carbohydrate. It can be taken as food or drink if the person is conscious and able to swallow. This amount of carbohydrate is contained in about 3–4 ounces (100–120 ml) of orange, apple, or grape juice although fruit juices contain a higher proportion of fructose which is more slowly metabolized than pure dextrose, alternatively, about 4–5 ounces (120-150 ml) of regular (non-diet) soda may also work, as will about one slice of bread, about 4 crackers, or about 1 serving of most starchy foods. Starch is quickly digested to glucose (unless the person is taking acarbose), but adding fat or protein retards digestion. Symptoms should begin to improve within 5 minutes, though full recovery may take 10–20 minutes. Overfeeding does not speed recovery and if the person has diabetes will simply produce hyperglycemia afterwards. A mnemonic used by the American Diabetes Association and others is the "rule of 15" – consuming 15 grams of carbohydrate followed by a 15 minute wait, repeated if glucose remains low (variable by individual, sometimes 70 mg/dl). ^ Stedman, Thomas Lathrop (December 2005) . "Stedman's Medical Dictionary" (28th ed.). Baltimore: Lippincott Williams & Wilkins. p. 2100. ^ Cryer, Philip E. (2001). "Hypoglycemia". In Jefferson L, Cherrington A, Goodman H, eds. for the American Physiological Society. Handbook of Physiology; Section 7, The Endocrine System. II. The endocrine pancreas and regulation of metabolism. New York: Oxford University Press. pp. 1057–1092. ^ a b Cryer PE, Axelrod L, Grossman AB, Heller SR, Montori VM, Seaquist ER, Service FJ (March 2009). "Evaluation and management of adult hypoglycemic disorders: an Endocrine Society Clinical Practice Guideline". J. Clin. Endocrinol. Metab. 94 (3): 709–28. ^ a b Cryer PE, Axelrod L, Grossman AB et al. (March 2009). "Evaluation and management of adult hypoglycemic disorders: an Endocrine Society Clinical Practice Guideline". J. Clin. Endocrinol. Metab. 94 (3): 709–28. ^ Cryer, Philip E. (1997). Hypoglycemia: Pathophysiology, Diagnosis, and Treatment. New York: Oxford University Press. ^ a b Koh TH, Eyre JA, Aynsley-Green A (1988). "Neonatal hypoglycaemia--the controversy regarding definition". Arch. Dis. Child. 63 (11): 1386–8. ^ a b Cornblath M, Schwartz R, Aynsley-Green A, Lloyd JK (1990). "Hypoglycemia in infancy: the need for a rational definition. A Ciba Foundation discussion meeting". Pediatrics 85 (5): 834–7. ^ a b Cornblath M, Hawdon JM, Williams AF, Aynsley-Green A, Ward-Platt MP, Schwartz R, Kalhan SC (2000). "Controversies regarding definition of neonatal hypoglycemia: suggested operational thresholds". Pediatrics 105 (5): 1141–5. ^ a b Tustison WA, Bowen AJ, Crampton JH (1966). "Clinical interpretation of plasma glucose values". Diabetes 15 (11): 775–7. ^ a b c [edited by] John Bernard Henry (1979). Clinical diagnosis and management by laboratory methods. Philadelphia: Saunders. ^ Clarke WL, Cox D, Gonder-Frederick LA, Carter W, Pohl SL (1987). "Evaluating clinical accuracy of systems for self-monitoring of blood glucose". Diabetes Care 10 (5): 622–8. ^ Gama R, Anderson NR, Marks V (2000). "'Glucose meter hypoglycaemia': often a non-disease". Ann. Clin. Biochem. 37 (5): 731–2. ^ de Pasqua A, Mattock MB, Phillips R, Keen H (1984). "Errors in blood glucose determination". Lancet 2 (8412): 1165. ^ Horwitz DL (1989). "Factitious and artifactual hypoglycemia". Endocrinol. Metab. Clin. North Am. 18 (1): 203–10. ^ Samuel Meites, editor-in-chief; Contributing Editors, Gregory J. Buffone...  (1989). Pediatric clinical chemistry: reference (normal) values. Washington, D.C: AACC Press. ^ Cryer, Philip E. (2003). "Glucose homestasis and hypoglycemia". In Larsen, P. Reed, ed. Williams Textbook of Endocrinology (10th ed.). Philadelphia: W.B. Saunders. pp. 1585–1618. ^ "20 White NH, Skor D, Cryer PE, Bier DM, Levandoski L, Santiago JV: Identification of type 1 diabetic patients at increased risk for hypoglycemia during intensive therapy. N Engl J Med 308:485–491, 1983". Content.nejm.org. Retrieved 2012-03-10. ^ "21 Bolli GB, De Feo P, De Cosmo S, Perriello G, Ventura MM, Massi-Benedetti M, Santeusanio F, Gerich JE, Brunetti P: A reliable and reproducible test for adequate glucose counterregulation in type 1 diabetes. Diabetes 33:732–737, 1984". Diabetes.diabetesjournals.org. 1984-08-01. Retrieved 2012-03-10. ^ "Hypoglycemia – National Diabetes Information Clearinghouse". Diabetes.niddk.nih.gov. Retrieved 2012-03-10. ^ Goto, Atshushi (July 30, 2013). "Severe hypoglycaemia and cardiovascular disease: systematic review and meta-analysis with bias analysis". BML. ^ edited by Allen I. Arieff, Robert C. Griggs (1992). Metabolic brain dysfunction in systemic disorders. Boston: Little, Brown. ^ C. Ronald Kahn ... [et al. ], ed. (2005). Joslin's diabetes mellitus (14th ed.). Philadelphia: Lippincott Williams & Willkins. p. 1154. ^ "Diabetes and Hypoglycemia". Diabetes.co.uk. Retrieved 2012-03-10. ^ Nancy Klobassa Davidson, R.N., and Peggy Moreland, R.N. "Living with diabetes blog". Mayo Clinic.